Do you want to build a snow man? For all the Anna fans out there... I had to create an Anna inspired Playground Princess dress! This dress has halter straps and back elastic to make it an easy grow with me fit. It is made with 100% cotton for breathable comfort and long lasting wear. She can wear this outfit for her birthday party, Disneyland & Disneyworld vacation, the first day of school, or simply to run around at the playground! 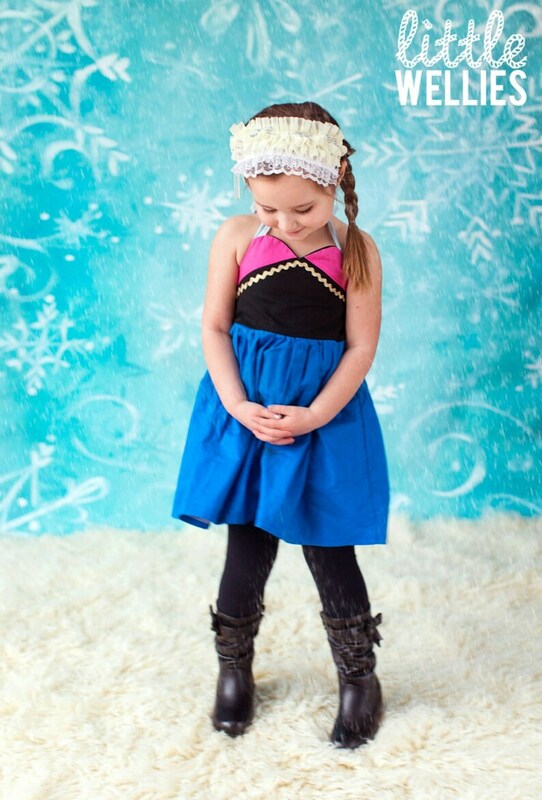 This dress is sure to get your daughter plenty of compliments and make her feel just like the star she is! Size 12-18m-- Height 26-32", Weight 15-28, Waist 18"
Size 2-- Height 32-36", Weight 29-32, Waist 19.75"
Size 3-- Height 36-39", Weight 32-35, Waist 20.50"
Size 4-- Height 39-42", Weight 35-41, Waist 21"
Size 5-- Height 42-45", Weight 41-46, Waist 21.5"
Size 6-- Height 45-48", Weight 46-51, Waist 22"
Size 7-- Height 48-51", Weight 51-57, Waist 22.5"
Cutest little tinkerbell I ever did see. Thank you so much for the perfect Halloween costume for my tinkerbell loving little one! discounts & coupons can not be combined unless otherwise noted and can only be used once. if the codes do not work or are not applied, i will gladly refund you. all types of giveaways/prizes/promos/discounts/codes must be used within 30 days. winners pay shipping fees. free shipping codes only apply to domestic shipping. due to the nature of this business, we do not accept any refunds or exchanges. all sales are final. this includes all online orders, custom orders, and craft fair purchases. please be sure of the size you want before you place your order, we will not exchange if the size you requested doesn't fit. if in the case a return needs to be made, all shipping costs are the responsibility of the buyer. it is up to the buyer to purchase tracking information. we are not responsible for lost packages. buyers have 10 days to postmark return packages after an approval for a return has been made. items that are in stock will say in the listing "ships in 1 - 3 days!" all other products ship within 4-6 weeks. if ordering multiple products, shipping may take longer. all US orders are shipped via USPS priority mail with delivery confirmation, and international orders are shipped USPS first class. all orders receive an e-mail with a delivery confirmation number upon shipment. should an item get lost in the mail due to an error by the Postal Service it is not our responsibility to replace it. insurance can be purchased separately if you choose to contact me with this request. it is not our responsibility if a package is delayed by the Postal service. its your responsibility to make your shipping address is correct on both Etsy and Paypal. we are not responsible for shipping to the "wrong" address if it is the address listed on your order receipt. some times fabrics go out of stock and can not be reordered, for this reason [and because sometimes there is just a better one out there!] fabrics may be substituted at the designers discretion. the colors vary from each computer screen as with different bolts. if this is a concern, please contact before purchasing, as all sales are final. ☛ in any case, if you are not satisfied with your purchase, please contact me before leaving any feedback. thank you.